While Canadian workplaces have become more diverse over the years, there is still more work to be done to advance diversity and inclusion in the workplace. In a survey conducted by Randstad, many of the respondents said they have experienced discrimination in the workplace. Among the participants, 26% were discriminated against based on age, 22% based on gender, 17% based on race, 16% based on sexual orientation and religion. Having diversity in the workplace is important because it is beneficial for both employees and the organization as a whole. It helps reduce recruitment challenges and skill shortages in the workforce by giving opportunities to new groups of skilled and talented people who are often underrepresented in the workplace. Increased diversity means casting a wider net and connecting with a greater variety of people resulting in stronger links to the community, greater visibility, and further reach. Diversity drives creativity as employees with different backgrounds and perspectives will have an extensive range of experiences, ideas and insights. However, when it comes to diversity there is more to it than just hiring people from different backgrounds. Many organizations are faced with the challenge of communication barriers as well as resistance to change from current employees who seek to maintain the status quo. Other challenges relate to the implementation and successful management of diversity in the workplace. Here are ways your organization can effectively tackle diversity in the workplace. Workplace diversity cannot only be a Human Resource initiative and just limited to recruitment. Diversity and inclusion must be part of your organization’s core values. Leaders and management at the top of the organization must be committed to diversity in order to send a clear message to the rest of the organization. When diversity is set as a high priority, it will become ingrained into your workplace culture. It is vital to create a culture where all your employees have a fair chance of succeeding, regardless of gender, race, ethnicity, sexual orientation or religious belief. There should be zero tolerance for discrimination in the workplace. Creating a diverse workplace takes time. Ensure to build a formal plan to support your diversity strategy with measurable goals that is integrated with your organization’s strategic objectives and processes. Remember to take into consideration the length of time it will take to cultivate a mentality that acknowledges that diversity is part of the overall strategy. Part of your plan should also include a corporate evaluation program that will enable you to stay accountable to your diversity goals. Training of current employees regarding diversity is also important to create and maintain a diverse workplace. The human resources department is often the one to take the lead with the implementation of the diversity initiatives. Such initiatives may include mentorship programs, awareness training and community reach out programs. HR can be the catalyst to develop opportunities and resources to support diversity programs for your organization. HR can be an advocate for diversity by acting as the ‘middle man’ between departments, management, the diversity task force, and different employee groups to ensure the intent and benefits of the initiative are being met. HR can act strategically by ensuing to include long-term and short-term goals into the overall organizational planning. Building a diverse workplace isn’t just beneficial for your organization and employees, it is one of the most important elements of business success. Studies have shown that organizations with higher levels of ethnic and cultural diversity are 35% more likely to achieve above average profits than companies with less diversity. 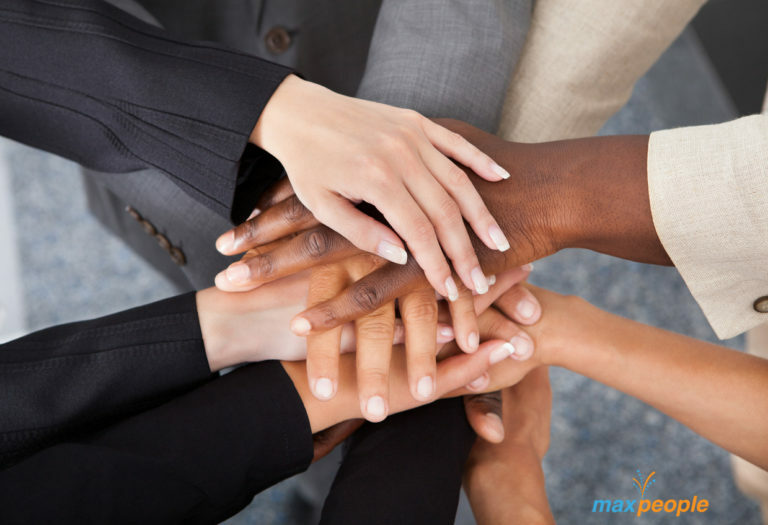 Reach out to MaxPeople for assistance with workplace diversity for your organization.